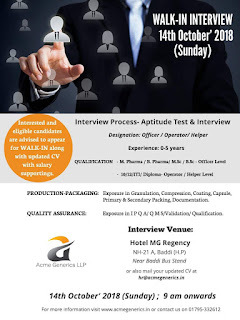 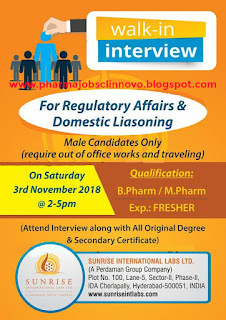 Walk-In Interviews for Freshers on 3rd November 2018 @ Sunrise International Labs Ltd - Hyderabad- Clinnovo! 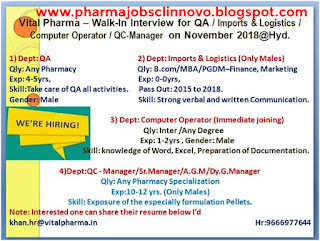 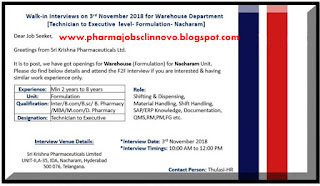 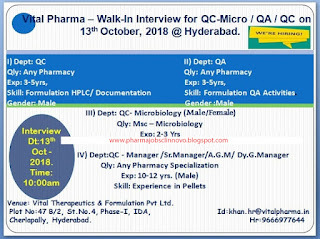 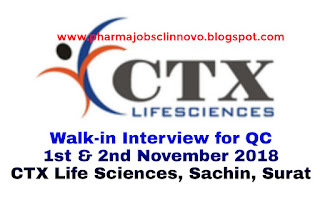 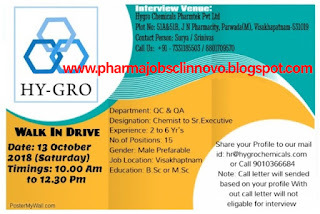 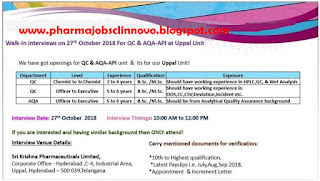 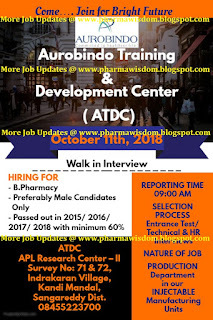 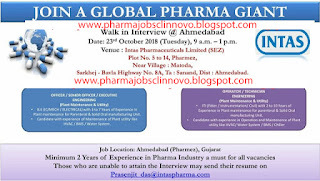 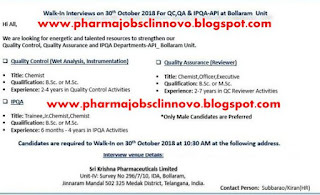 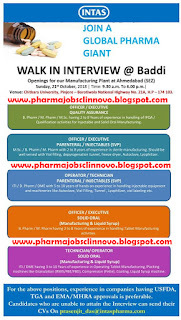 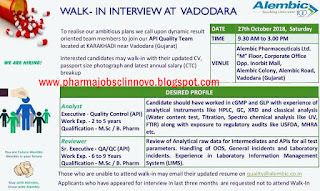 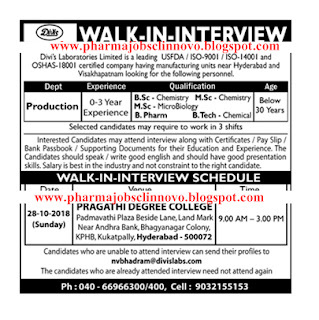 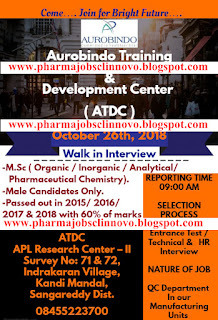 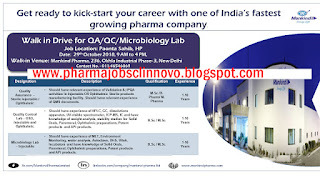 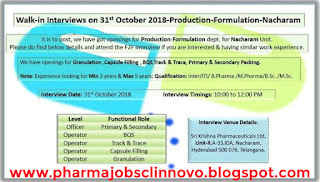 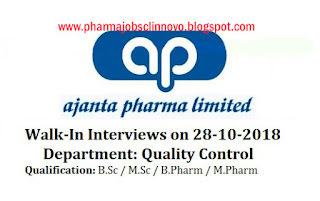 Sri Krishna Pharmaceuticals Ltd Walk In Interviews for QC / QA / IPQA on 30th Oct 2018 - Clinnovo! 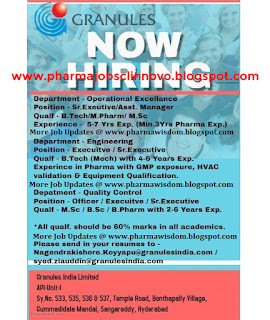 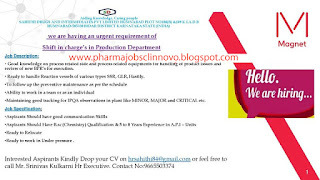 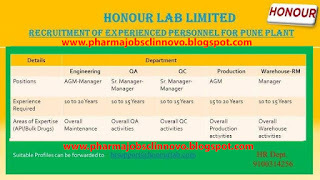 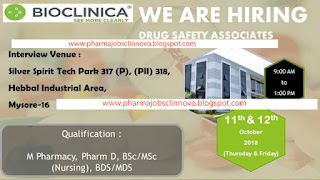 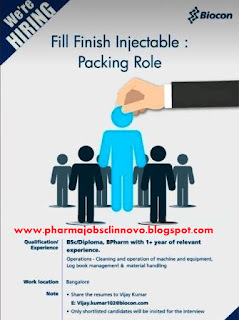 Cipla Urgent Vacancy for B.Pharm, D.Pharm, B.Sc for different Locations - Clinnovo! 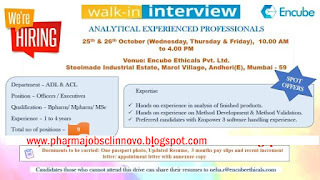 Walk-In Interviews on 25th & 26th October 2018 for Analytical Experienced Professionals @ Encube - Clinnovo! 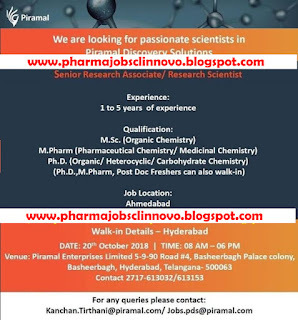 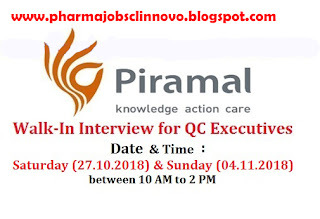 Piramal Enterprises Ltd Walk In Interviews for QC-Executives on 27th Oct & 4th Nov 2018 - Clinnovo! 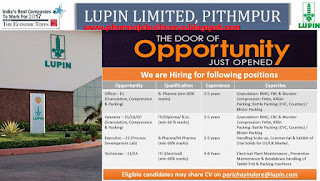 Lupin Limited Urgently Hiring Officer / Operators / Executives / Technicians - Clinnovo! 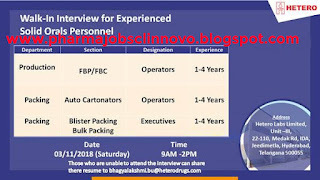 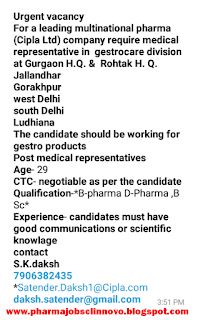 Interviews for Production Operators (Formulations): Jadcherla: 28-Oct-18 Department: Production Role: Operators Experience:Ideal candidate should have 2 - 6 Years experience in Production (Granulation/ Wurster Coating / Capsule filling/ Compression/ Coating). 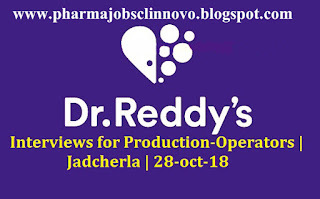 Openings: 10 Location: Hyderabad (Bachupally) Date & Time: 28th October from 9 AM onwards Venue: Yagnesh Virat Regency, NH - 44, Jadcherla Telangana Job Description: - Responsible for executing the production targets of the module as per the production schedule. 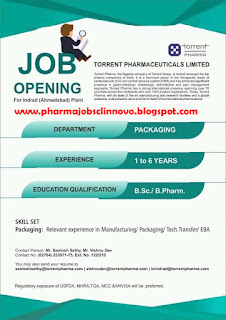 - To implement and follow the policies and procedures for efficient function of the machines. 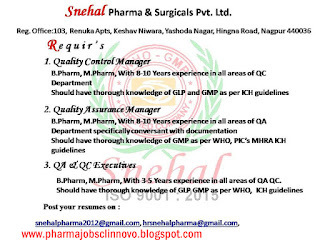 - Responsible for strict adherence to the standard operating procedures and cGMP requirements. 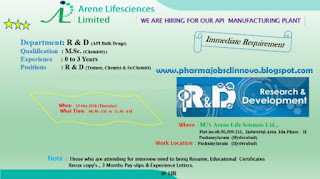 - Responsible for upkeepment of the production module and online documentation. 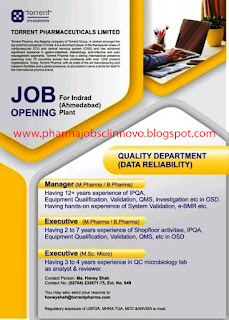 - Responsible for implementing the productivity improvement measures. 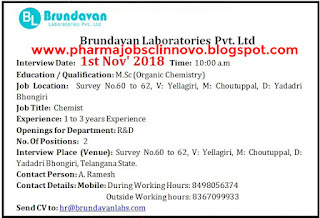 Should have M.Sc Freshers (Analytical & Organic Chemistry) and Passed out in 2016 or 2017 & 2018 only. 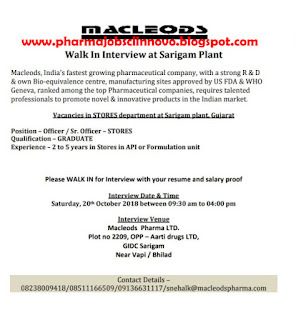 Macleods Walk Ins for Freshers & Experienced Candidates on 19th & 20th Oct 2018 - Clinnovo! 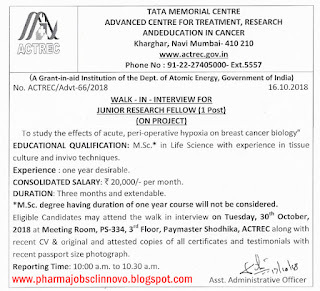 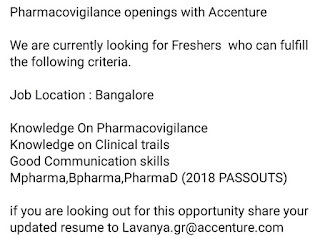 TCS Walk in Interview for M.pharm Freshers 2017/2018 for Pharmacovigilance on 12th Oct 2018. 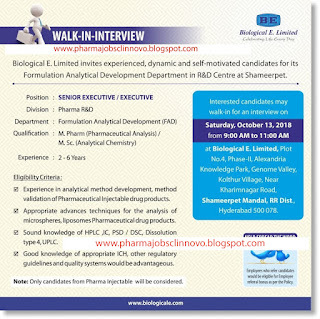 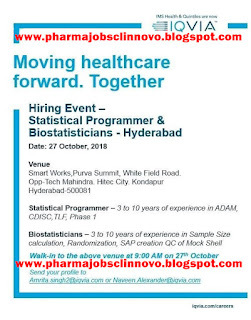 Biological E. Limited Walk In Interviews on 13th Oct, 2018 @ Hyderabad - Clinnovo!